I really wanted a vintage stove for my next home. I don’t own an oven right now and that is something I am really missing. I do own a combi microwave but it’s just not the same. Of course I could just have bought a new stove but a vintage stove is so much more special. I love the style and I love it when something has been used for so many years and still looks great. You can’t believe how lucky I felt when my mother told me about something my sister Janet found on the internet. This stove is just perfect! I know that if she could use it my sister would have bought it. But she can’t so I couldn’t resist buying it for myself. Sorry Janet! Read something about the history from this fifties stove after the jump. . . This stove is from around 1958 and was owned by an old lady who is now going to a home for elderly. She didn’t do a lot of cooking in the past few years but baking was a hobby from her. She baked cakes at least a few times every week. I love that this stove has been loved and been a part in someones hobby. That makes it so much more special. 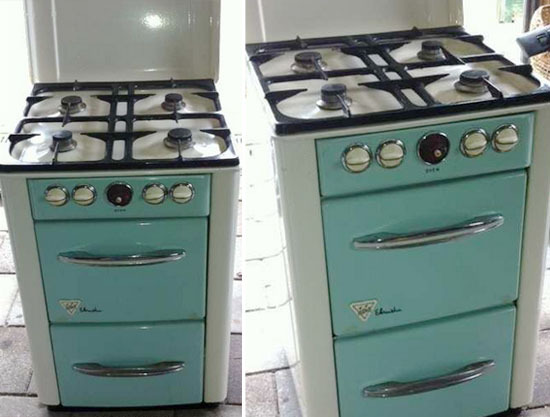 I bought this super cute fifties stove for 130 Euro’s. Well worth it in my opinion.